A couple of months ago our karate instructor was promoted to 6th Degree Black Belt and awarded the title of Kyoshi. This is a big deal in our system! It takes 3 1/2 or more years to earn your first degree black belt, and even longer to earn higher ranks. Kyoshi’s been studying karate for over 20 years. Our club was at the belt test to celebrate with Kyoshi, and when we returned to class the following week decided an additional celebration was in order. Celebrations for us include food, of course! We love our Banzai Treats! One of Kyoshi’s favorite cakes is a Chocolate Pistachio Cake. This is also a favorite of several friends at work. I’ve made this several times and in many forms – as a bundt cake, layer cake, regular and jumbo muffins, and as a sheet cake. This time, in celebration of Kyoshi’s promotion, I wanted to make a cake that represented his new rank / belt, so I went with a sheet cake. This is a super moist cake, thanks to the pistachio pudding and it’ll hold for several days, assuming it lasts that long. 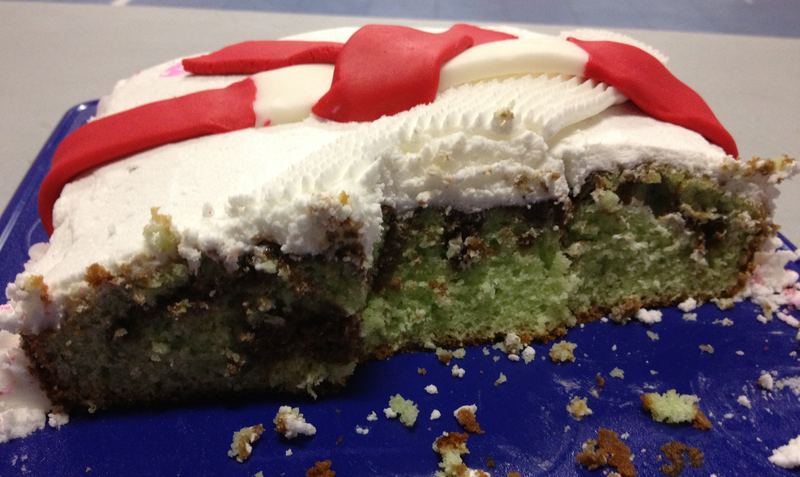 If you want the cake a little bit greener, add a couple of drops of food coloring. I did to this batch and you can see the color in the picture below, but normally I don’t add any extra green. The cake is just sweet enough that it doesn’t need a rich frosting. I frosted this with the butter cream frosting typically used to decorate cakes. If I wasn’t decorating it, I probably would have either dusted it with powdered sugar or just used a light chocolate glaze. 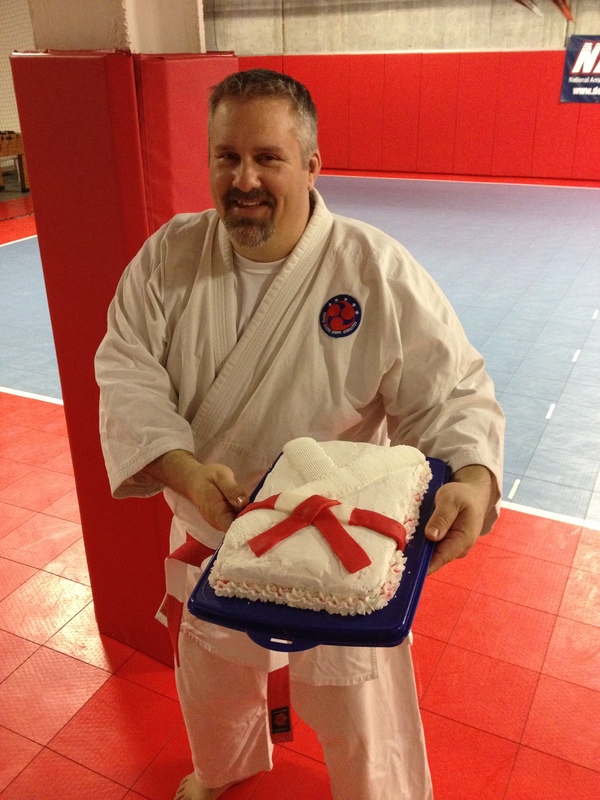 The Kyoshi belt in our system is red and white, so I used fondant to create the belt for the cake. I haven’t used fondant much, and could probably have done a better job, but it turned out OK. The more I use it, the more skilled I’ll become. At least that’s the hope! Don’t wait for a big karate promotion to try this cake. 😉 It’ll quickly become one of your favorites! Grease and flour a 10 inch Bundt pan. In a large bowl, mix together the cake mix, pudding mix and sugar. Add water, oil and eggs and mix well. Reserve 1 cup batter and pour the rest of it into the prepared pan. Stir the chocolate syrup into the 1 cup reserved batter. Pour the chocolate batter over the pistachio batter and use a butter knife to swirl them. Don’t overmix or you will lose the swirly effect. Bake in the preheated oven for 50 minutes, or until a toothpick inserted into the center of the cake comes out clean. Allow to cool. NOTE: If you choose a different pan size / shape, follow the baking directions on the cake mix box. This will make a 9 X 13″, about 2 dozen normal sized muffins, 2 9″ cake layers…basically, whatever the cake mix would make.